A key focus of this blog is the history of Jacksons in Ireland. I am specially curious about those who may be related to Sir Thomas Jackson (1841-1915). His life is key to understanding how a dozen or so young men, sons of Irish tenant farmers, shaped the future of international banking in the Far East in the late 1800s. I also use this blog as a place for playful posts: book and restaurant reviews, recipes, and events in my life. WARNING: Note the date of each post. Some may be outdated. Over the years, I have read quite a bit about the 16th Century goldsmiths of Lombard Street. Some of them were named Jackson, and some were the precursors of those early London bankers who followed. It was quite something to then be able to walk along Lombard Street on a sunny spring afternoon, and to peek down all the lanes and alleys feeding into it, while imagining what it might have looked, smelled, and sounded like in the era of horse and buggy. It took only minutes for me to walk from there to the site of Pasqua Rosee’s Head, the place where London’s first coffee shop opened in 1652. Ship’s captains and merchants and money lenders all gathered there to soak up the equivalent of insider information. Later in the 1600s, the goldsmith John Jackson plied his trade nearby, using the emblem of an angel as his mark. 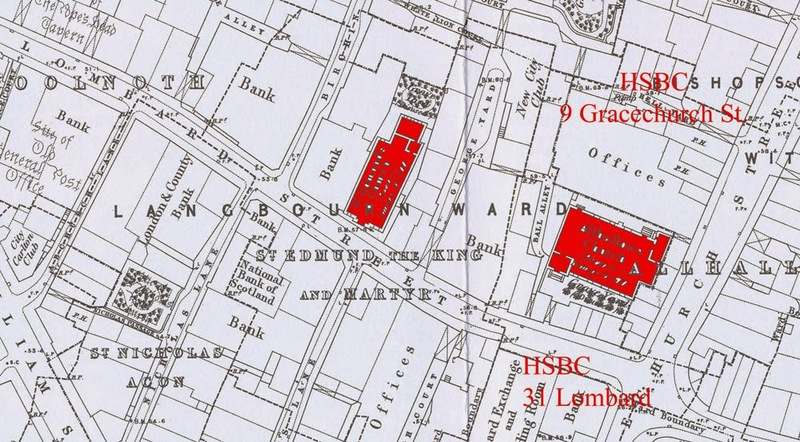 Coincidentally, 31 Lombard St. was also the street where HSBC’s London office was housed until it moved to #9 Gracechurch Street. It was also the same street where the memorial for Sir Thomas Jackson, an HSBC manager for much of latter part of the 19th century, was held at noon on December 24th, 1915. He had died, just around the corner from Lombard, in his latest HSBC office at #9 Gracechurch on December 21, 1915. After hours of walking in The City, I decided that I needed a break, and walked into a church on Lombard Street just across from Clements Lane. In a fluke of synchronicity it turned out that the historic church of St. Edmund the King was otherwise known as The Banker’s Church. I have since learned that the word bank came from the Italian word banco which referred to the stalls set up by the early merchants in Lombard Street. I have also learned that this was a church where the privileged had once congregated. For close to four decades at the start of the 20th Century, one of the church wardens was the Chairman of Barclays Bank. What struck me as I was absorbing the peace and quiet while reading a pamphlet by The London Centre for Spirituality, was the harmony of the architecture, and how the bones of it are still honoured. 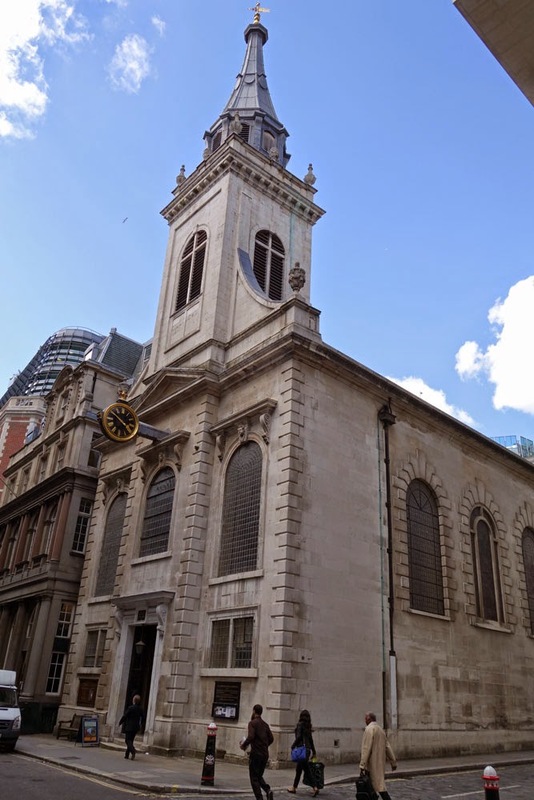 The church had been built in the 1670s, based on designs by Sir Christopher Wren. The pews are long gone, but I felt as I sat there and imagined a service taking place around me, it seemed that the congregation would probably not have exceeded a couple of hundred at best. At the rear of the church, a garden continues to be a welcome bit of green amongst all the surrounding grey. If I lived in London, especially in The City, I would come here often, for the quiet. My visit was in the spring of 2014, the 100th anniversary of the start of World War I. I couldn’t help but notice the stained glass window above me on the eastern wall. TO THE GLORIOUS MEMORY OF THE OFFICERS NON-COMMISSIONED OFFICERS AND THE MEN OF THE 26TH BATTALION THE ROYAL FUSILIERS BANKERS WHO GAVE THEIR LIVES IN THE GREAT WAR 1914-1918. Claude Stewart Jackson, his youngest son, was killed on October 9, 1917 near Ypres at age 25. Lt. Col Raymond John Marker, his son-in-law, died of injuries in Boulogne November 13, 1914. George David McCullagh, his much loved nephew whose schooling Thomas Jackson had paid for, died March 28, 1918 at age 22 during the Fifth Army retreat at the Somme. His name is one of thousands commemorated at the Pozieres Cemetery Memorial Register, near Thiepval. Another nephew, Andrew Hugh Gilmore Jackson died January 31, 1918 of cholera contracted while serving in the army in Hong Kong. He was buried at Happy Valley, Hong Kong. Both nephews had worked for HSBC in the Far East. There were other young men who died in the war, who were well known to Thomas Jackson, men such as Sydney John Townsend, the son of Alfred Markham Townsend, another HSBC staffer. Sydney died at Ypres on May 13, 1915. Other sons were seriously wounded, but not killed. Thomas Jackson’s eldest son, Thomas Dare Jackson fought on much of the same ground as the men mentioned above did. So did his brothers, George Julius Jackson and Walter David Russell Jackson. All bore the scars, both physical and emotional. 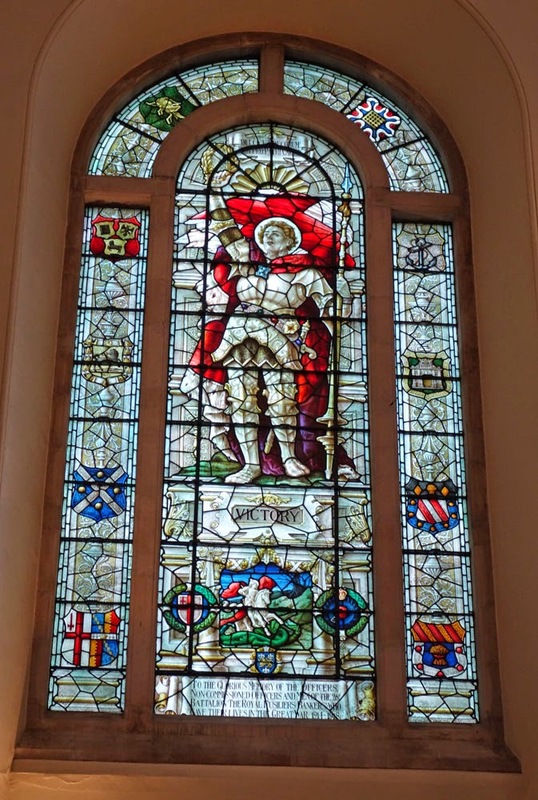 The presence of this window, as well as the fact of this church being known as the Bankers’ Church, made me imagine for a bit that it must have been the church where Sir Thomas Jackson’s Memorial Service had been held. This is proof, once again, that a little knowledge is a dangerous thing. After I had returned to my home computer, and was able to reread the news accounts of the day, I realized that Jackson's service had been held at All Hallows on Lombard Street. This was one block away from this church, on the corner of Gracechurch and Lombard Streets. Unfortunately, for any personal connection I might have been able to have with the bricks and mortar of that church, All Hallows was demolished in 1937. All that remains are a few lithographs and photos, as well as vestry books and such. The occupations of fathers recorded in the baptismal records show that they were shirt cutters, chimney cleaners, police constables, dairymen, victualers and the like. Since Thomas Jackson enjoyed social life with all kinds of people, not only the privileged, this kind of congregation felt like a fit with the kind of life that he had lived. In the records I perused, I saw no mention of a single banker, barrister, or high ranking military or government man. This church was not the parish home of men such as those who ran Barclays. At the same time, it is risky to read too much into this choice of church. Sir Charles Addis, the manager of HSBC and a caring friend of Jackson, had arranged the service on behalf of the widow, Dame Lydia Jackson, and size may have been the main reason why it was chosen. According to an 1873 map, the Banker’s Church could only seat 200, about what it had felt like to me when I was sitting there, while All Hallowes could seat 510. How many attended that service in 1915? Ninety-three people are mentioned by name in the newspaper accounts posted to my website, but many more would have attended. For example, the news accounts of the burial service in Stanstead, which had also occurred at noon on the same day as the one at All Hallowes, did not mention the presence of Thomas Jackson’s youngest daughter Dorothy, yet in a family letter, she was described as walking bravely down the aisle. Plus ça change, plus c'est la même chose. Dorothy was neither male nor famous. It was only her brothers and those who were the known pillars of society who were worthy of note in both accounts. I would not be at all surprised if I were to learn that the service had been standing room only. In the map above, I have highlighted the locations of both churches. All Hallowes is on the left. On Google Street view, you can see a Boots pharmacy there. I have made a rough guess at the location of 31 Lombard, but am still a little uncertain. Google street view indicates that 31 Lombard is just west of Plough Court. The building shown at that place in the 1873 map is labeled: Offices. There are also nine other banks located on Lombard St. in 1873, and I do not yet know which ones are which. Using trade books, which I do not have access to right now, it wouldn’t be hard to nail them all down. (One more task for my to-do list). On the other hand, I am certain about the location of 9 Gracechurch address, the current home of the Crosse Keys pub, in part because I enjoyed a nicely balanced Mojito there. 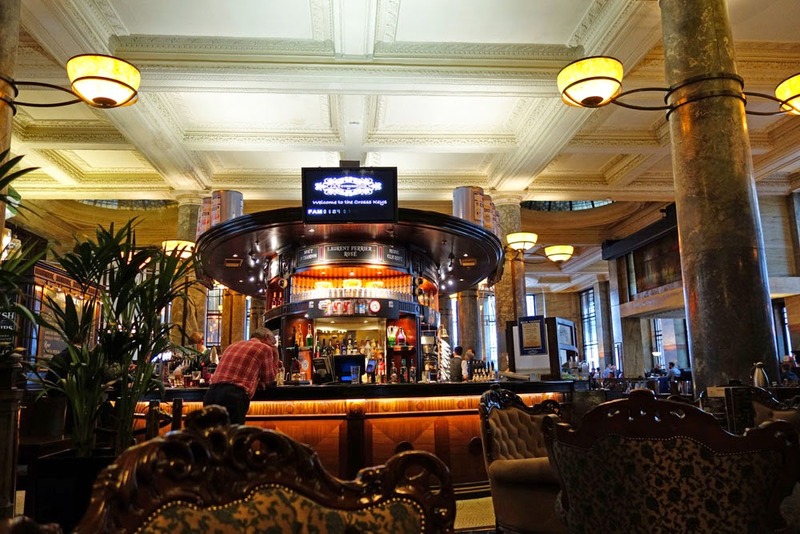 The best place to be able to carry on a conversation is at the back of the whole bank building, behind the bar. An excellent blog post: Why is St Edmund the King Known as ‘The Banker’s Church’? Although it is still a consecrated church, it is also a venue for hire, an enterprise which brings in revenue that helps with the upkeep. Parish Records of All Hallowes, St. Lombard Film Number: 1951323. I have only looked at a few pages. There is mention at Find-a-Grave that records are at the Guildhall library. See also London Metropolitan Archives. In the early 1700s, the firm of Knight and Jackson operated under the Unicorn on Lombard Street. SEE: A Handbook of London Bankers. SEE: The London Goldsmiths. By the Worshipful Company of Goldsmiths, 1936 by Sir Charles Jackson. See also English Goldsmiths and their Marks, C.J. Jackson, 1905. Also London Vol 4 ed. Charles Knight page 17ff. 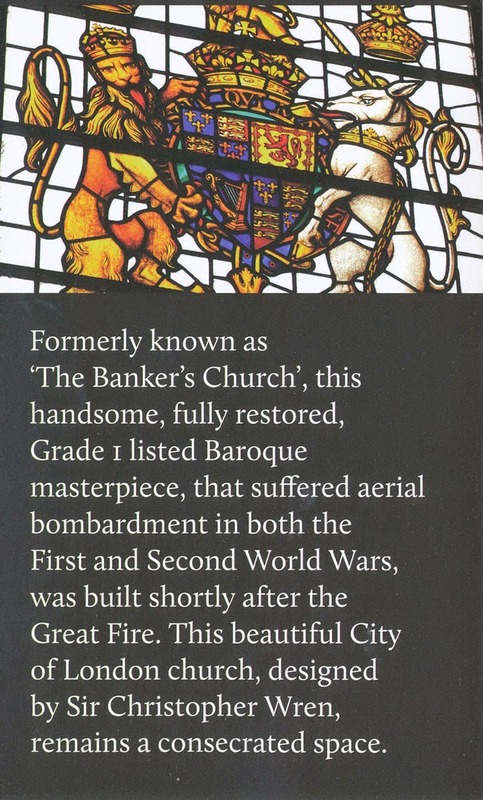 for a history of London Banking. A quiet place for lunch, worthy of notice in the area, was Qian Long on 46 Gresham Street. Their dish with sautéed kale and string beans was served fresh, piping hot, and perfectly seasoned. That statue does look like Margaret Thatcher. I enlarged it and looked at the face and it's Margaret to a T! How funny is that?!! Author And Researcher. I am currently writing a book on the life of Sir Thomas Jackson. He was the son of tenant farmers, born just before the Famine in South Armagh, who was knighted because he not only lead HSBC into the 20th Century, but was also responsible for assisting with the funding of much of the economic development in China & Japan in the late 1800s. My first published book was "Some Become Flowers: Living with Dying at Home". Blog customization by Bad Dog Design Inc.
Sharon Oddie Brown. Simple theme. Powered by Blogger.